We now stock a small but growing range of RC fittings which we intend to expand rapidly. 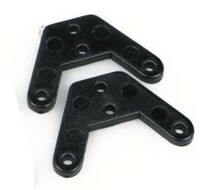 Enables a clevice-end to be fitted to push rods or bowden cables. Enables an M2 male thread to be attached via soldering to a bowden cable or push rod. For extra security, we often use these horns with M2 stainless cap screws and nyloc nuts. The cap screws will self-tap into the back plate pilot holes and the addition of the nyloc makes a completely positive vibration resistant connection to the controlled surface. The cap screw should be minimum length of 8mm plus the thickness of the control surface. Polypropylene hinges are suitable for fixing in place with white glues and slow set cyano adhesives. The hole in all the clamps are 3.2mm dia with a 5.4mm dia counterbore. are ideal for securing these clamps. For safely connecting pushrod ends to servo arms. Supplied in packs of 1m of cable and 1m of outer sheath. Used to turn linear motion through 90 degrees and used for control surfaces and throttles etc. 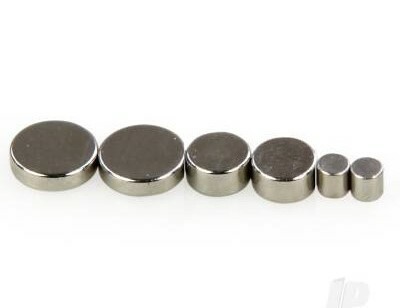 We stock three sizes of small but powerful permanent magnets that are particularly suitable for securing hatches and canopies (glue the magnet in place and use steel headed screw on the mating part). For extra security magnets can be used on both parts but test the adjoining faces for opposite polarity before securing in place.